1984 – Cook is a 4-Letter Word! was written, illustrated and published by Gloria Pitzer (Gloria Pitzer’s Secret Recipes, St. Clair, MI). NO LONGER IN PRINT – at 120-pages with a 5.5″ x 8.5″ format, this nifty little book is full of well-balanced meals for the unbalanced cook! It also has goodies to take the monotony out of mealtime and turn the task of cooking into a treat – rather than a treatment! 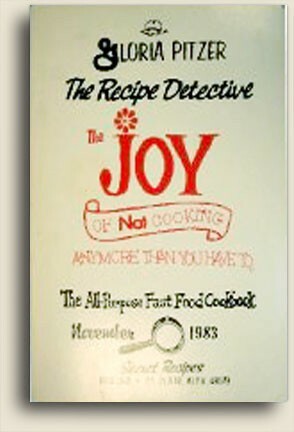 If you like to laugh while cooking or cook while laughing, this is the book for you! 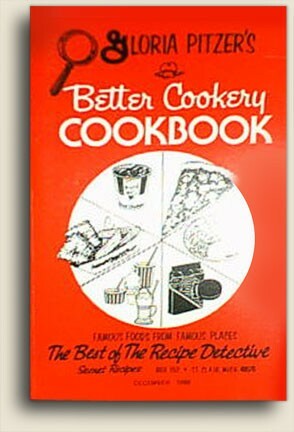 This book is also for the “I-don’t-cook-much…” cook! It’s the kind of book you can enjoy reading without ever having to turn on the stove! The recipes are basic and wonderful – for when you don’t have the time, energy nor extensive supply of ingredients – and the conversation that each recipe includes should leave you with a complete understanding of how to confront any challenge in the kitchen! 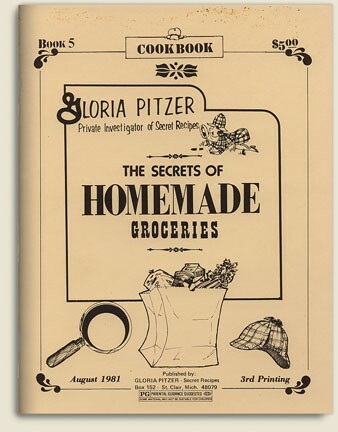 1983 – Gloria Pitzer’s Christmas Card Cook Book was a limited edition that was written, illustrated and published by Gloria Pitzer (Gloria Pitzer’s Secret Recipes, St. Clair, MI). 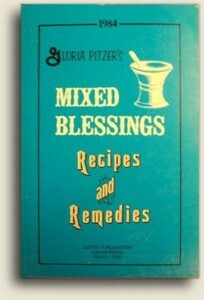 NO LONGER IN PRINT – this little recipe booklet had a 22-page, 5.5″ x 8.5″ format filled with interesting customs and history tidbits about the Hanukkah and Christmas holidays, humorous readings and 36 recipes. Perfect for gift-giving and stocking stuffers, these booklets sold for $2 per copy. 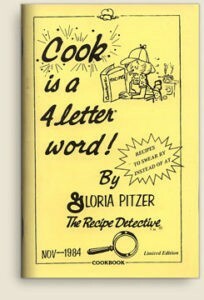 1983 – The Joy of Not Cooking Any More Than You Have To was written, illustrated and published by Gloria Pitzer (Gloria Pitzer’s Secret Recipes, St. Clair, MI). NO LONGER IN PRINT – this cookbook has a 240-page, 6″ x 9″ format, filled with more than 700 recipes for making more of your favorite restaurant dishes or grocery products at home, in much less time, using fewer ingredients and at a minimum cost. 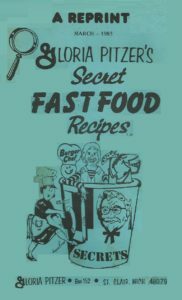 There’s also an array of Gloria’s trademark humor, inspirational stories and “Food-for-Thought” tucked in the pages as well. 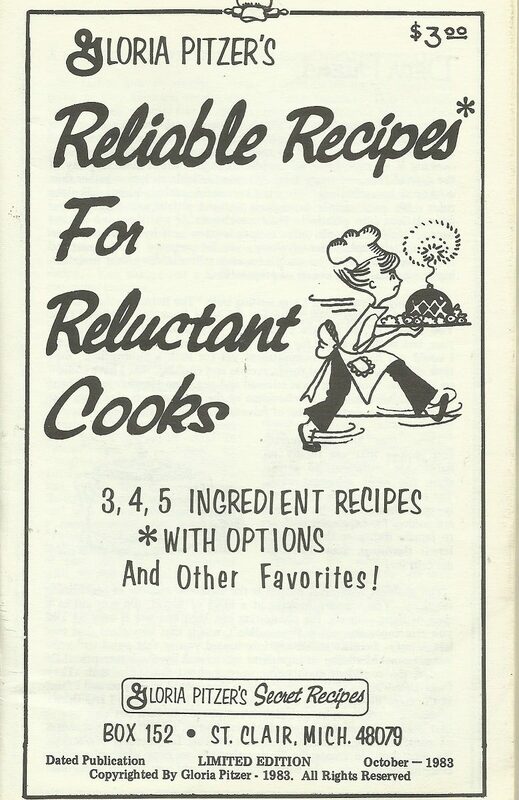 1983 – Reliable Recipes for Reluctant Cooks was written, illustrated and published by Gloria Pitzer (Gloria Pitzer’s Secret Recipes, St. Clair, MI). 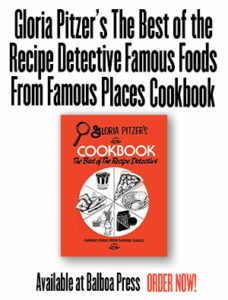 NO LONGER IN PRINT – having a 45-page, 5.5″ x 8.5″ format, this limited edition Cookbooklet, as Gloria called it, is filled with a collection of 3, 4 and 5 ingredient recipes (with options) that are totally reliable – sufficient to satisfy even the most reluctant cook; along with Gloria’s trademark humor, inspirational stories and “Food-for-Thought”. 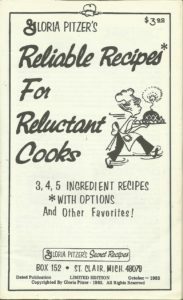 The recipes are quite basic, but the options are endless for expanding them into fancier dishes or different flavorings than for which the original recipes call. Plus, other popular favorites as well! 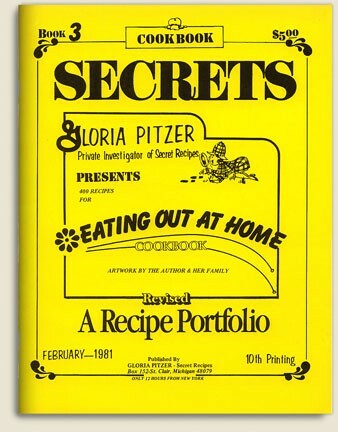 1982 – Gloria Pitzer’s Better Cookery Cookbook – was written, illustrated and published by Gloria Pitzer (Gloria Pitzer’s Secret Recipes, St. Clair, MI). 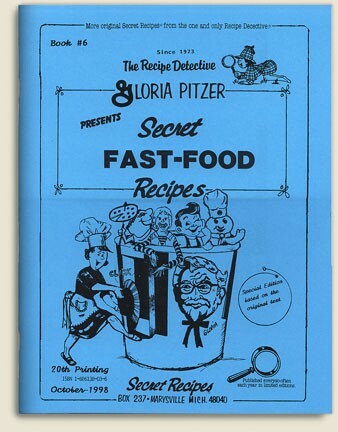 NO LONGER IN PRINT – this cookbook, having a 6” x 9” format with 400 pages, is a unique assembly of nearly 1,000 make-at-home, make-alike recipes of Gloria’s famous fast foods, restaurant dishes and grocery products collection. 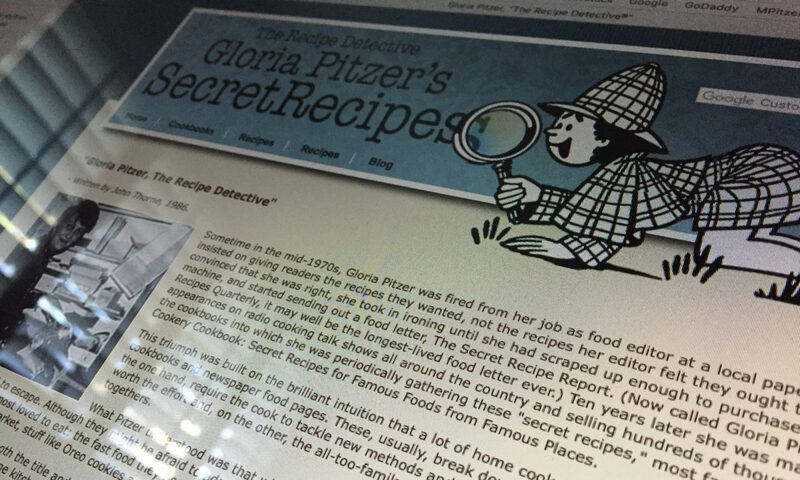 In addition, Gloria includes various historical information, illustrations and photographs along with her usual wit, food-for-thought and humorous stories. 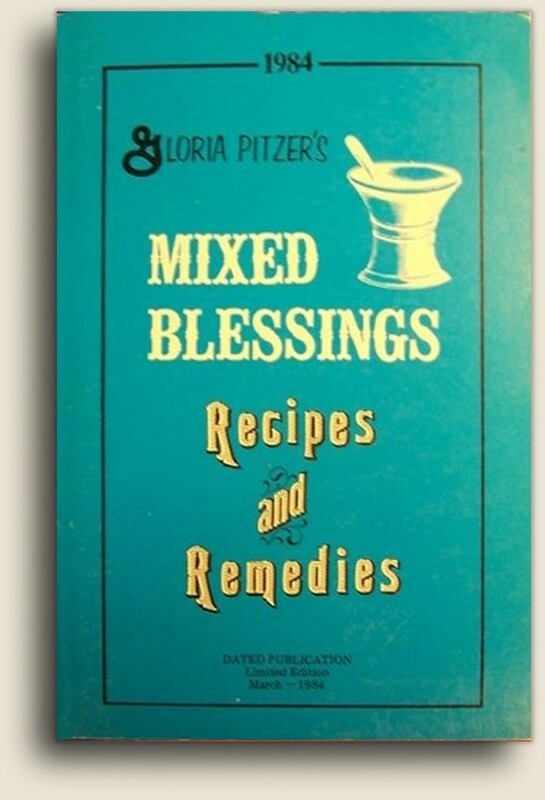 This book was actually inspired from a much needed vacation that Gloria and Paul took from their business in 1979, after completing and publishing Book 5, taking their 2 minor daughters, Laura and Cheryl, with them. They stayed at the Grand Hotel on Mackinac Island where they just so happened to be filming “Somewhere in Time” with Christopher Reeve, Jane Seymour, and Christopher Plummer. The Pitzers were lucky enough to meet the three movie stars at breakfast one morning; and, while Gloria was smitten with Christopher Plummer, in the back of her mind she was already taking notes for what would become a special section of this cookbook – about the elegant dishes served at the Grand Hotel. 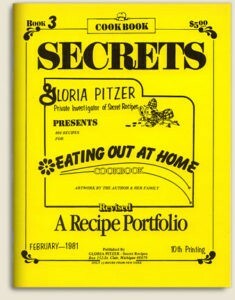 1979 – Gloria Pitzer Presents Top Secret Recipes Al’a Carte cookbook was written, illustrated and published by Gloria Pitzer (Gloria Pitzer’s Secret Recipes, St. Clair, MI). 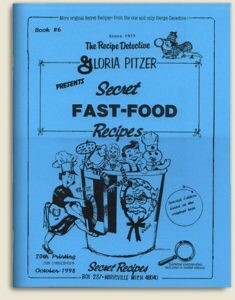 Some of the art work in this book was also done by 2 of Gloria’s 5 children, Mike Pitzer & Debbie Pitzer (now, Hamilton). 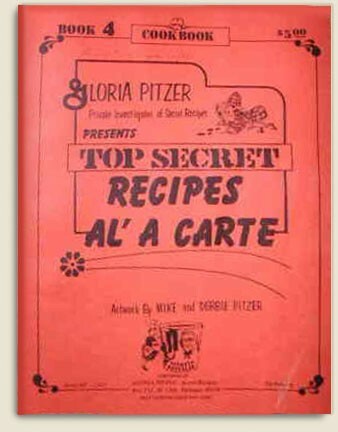 NO LONGER IN PRINT – this cookbook, sometimes referred to as “Book 4” or the “Orange Book”, had a 52-page, 8.5″ x 11″ format and sold for $5 per copy. The recipes in this book were uniquely laid out like an encyclopedia, in alphabetical order; so, there was no index included in the 1st printing. However, one was added in later printings with over 370 index listings. Over the many years and various printings, the cover was changed slightly, but the title always remained the same, along with the original masthead, “Cookbook”.